It seems to be as official as it can really be without the club actually confirming it. The chase is over and Vancouver Whitecaps have their new attacking midfielder – 22-year-old Korean international Hwang In-beom. The ‘Caps beat out competition from a couple of Bundesliga 2 clubs to land the promising midfielder, paying a rumoured transfer fee of $1.8 million to prize him away from K League 2 side Daejeon Citizen. It’s a big splash for the Whitecaps, and certainly not one without risks. Hwang is young and relatively untested at a higher level, having played all but one season in the second tier of the K League. The Daejeon native has primarily only played his football for his hometown club, coming through their academy before signing pro terms in 2015. The exceptions to that are his matches with the South Korean national team and the small spell he had with army side Asan Mugunghwa during conscripted military service last year. The latter producing one of the best stories you’re likely to get from any of the Whitecaps new signings, with Hwang being released halfway through his military service as a reward for being part of the South Korea side that won the gold medal at the 2018 Asian Games. I’m not sure if his service would have been doubled had they lost!! Hwang has earned caps with South Korea at U17, U20, U23, and senior team levels, and has just been over with his country at the Asian Cup in the UAE, where they bowed out at the quarter-finals stage to Qatar on Thursday. That exit thus allowing the ‘Caps to finally get the transfer done after Vancouver’s VP of soccer operations Greg Anderson had earlier flown out to the UAE and Korea for contract talks. 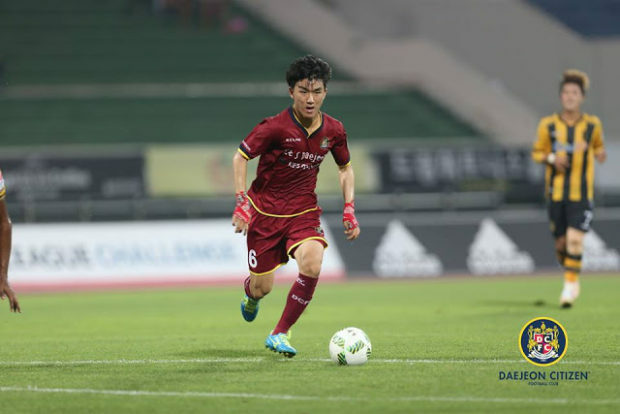 Hwang has made 72 appearances across all competitions for Daejeon Citizen in his four seasons with them, scoring 10 goals and adding 10 assists. Here’s what those looked like. Hwang’s playing time at Daejeon has been split between playing as an attacking midfielder and a central midfielder, with even four as a defensive midfielder in amongst them, so the ‘Caps are certainly getting a player that can tick a lot of boxes and plug various holes as required. Knowledge of the K League in general is somewhat sparse in North America, never mind the second tier of it. So just what kind of player are the Whitecaps getting in Hwang? What will he bring to Vancouver and MLS, and does he have what it takes to settle in quickly and make it in new surroundings? Well, if you want such answers, you go to an expert, and that’s exactly what we did, as we had an interesting chat with Paul Neat, the Daejeon Citizen English language correspondent and an Associate Editor for KLeagueUnited.com. He’s been watching Hwang sing 2015 and here’s what he had to tell us about the latest Whitecap. AFTN: What kind of a player are the Whitecaps getting in Hwang? He seems versatile in the middle, but is the number 10 role the one he thrives best in? Paul Neat: He is versatile as he is able to operate as holding midfielder/deep lying playmaker or higher up the pitch in the number 10 role. He is an attack-minded player so the number 10 role suits him best, I think. He likes to be the one who picks out that killer pass and link up with the wingbacks so being in a more advanced position is where I’d expect him to play. How is Hwang thought of at Daejeon Citizen? Is he a key member of the team that’s going to leave a massive hole to fill and what impact has he had with the club in his time there? He is loved at Daejeon and the fans call him “the Son of Daejeon” because he came through the ranks and was born in the city. From 2015 – 2017 he was an important player for the club but moved to Asan Mugunghwa on loan in 2018 to begin his military service. He was a regular for Asan who eventually went on to secure the K League 2 title after he returned in October following Korea’s gold medal win. Daejeon did fine without him but the difference in the way the team played once he returned was noticeable. He rarely gives the ball away and is always looking forward or to pick out a pass that will help carve an opening. He will be missed but the fans recognise what a huge talent he is and wish him well for the future. He’s played his whole career in Korea. Other clubs were apparently interested in him, including a couple in Germany. What do you think it was about Vancouver and MLS that proved attractive to him at this point of his career? It will have been the opportunity to test himself in a really competitive league, against good players and with different coaching methods to what he has been accustomed to. He has time on his side given that he is still only 22 and so, even if the player does have aspirations to play in Europe, going to MLS and proving himself on a larger stage than K League 2 will have been an opportunity which was too good to turn down. DAZN has been showing J League games here, but the K League is still something of a mystery to many in North America. Hwang has been playing in K League 2, how do you see that level of play comparing to what he’s going to be coming to in MLS? The jump from K League 2 to MLS will be sizeable. However, Hwang has made the step up to being a full international over the last six or seven months almost seamlessly and so has proven that he can take things in his stride. Even K League 1 to MLS would be a big step up but, he’s young and has bags of potential. There may be an initial settling in period but with the hunger that he has, I am confident that he will be a success. MLS is a physical league and fast paced, along with a lot of travel and some weird quirks (a lot of turf pitches for example). You’ve watched him from 2015, do you feel he’s suited to that kind of play and the kind of guy that will settle into new surroundings quickly, both on and off the pitch? How’s his English for example? The physicality is something that he may have to adjust to, certainly in the beginning. He is a tough, young lad but certainly needs to work on that side of his game and physique. However, the fast-paced nature of the league will be something that he is used to as K League is played at a high-tempo quite a lot of the time too. He’s very confident and keen to learn and so I am sure that he will be an asset to MLS and Vancouver Whitecaps. This will be his first time away from home but I think that, if he can hit the ground running and perform well then everything else will fall into place off the pitch too. My understanding is that his English is basic at best but he was having lessons not so long back and will no doubt be doing so again given where he is heading. There haven’t been a lot of Korean players come to the league over the years. Seattle’s Kim Kee-Hee is currently the only one. This is possibly due to some of the reasons mentioned above, but we had YP Lee here in Vancouver who has spoken very highly of the league and there is a large South Korean community in various MLS cities. Do you feel there could be a number of K League stars watching Hwang’s move now with an eye to making a future move? I certainly don’t see why not. There’s a lot of talented young players here in K League and going to MLS could be a great way to move abroad to further their careers. Likewise, for the MLS, players like Hwang Inbeom would come relatively cheap compared to European or perhaps their South American counterparts. There has been a lot of buzz around Hwang for a while now and so, if he can perform well in MLS it could open the door for others to follow. So there you have it. An exciting prospect, highly thought of, with a bright future ahead of him. Can he hack it over in a new league and a new environment? That’s the big question right now. The whole Masato Kudo experience didn’t pan out too well here, but if Hwang can adjust to the more physical nature of the game, he’ll hopefully have a better supporting cast around him to succeed. Many thanks to Paul for answering these questions for us. You can read all his stuff on KLeagueUnited.com, the English language site for the Korean league, where he is the correspondent for Hwang’s team Daejeon Citizen and an Associate Editor for the site. You can also follow Paul on Twitter @NeatPaul.